Four interwoven stories that occur on Halloween. Every Halloween is usually spent by many horror fans watching the "Halloween" films, it's become a tradition by many, me included. In 2007 "Trick 'R Treat" came along and another film was added to the list of essential Halloween viewing. For those who don't know the film is a horror anthology consisting of four stories that are all linked in some way. The four stories are: An everyday high school principal has a secret life, a college virgin might have just met the one guy for her, a group of teenagers pull a mean prank and a woman who loathes the night has to contend with her holiday-obsessed husband. So lets take a look at them all individually. The film opens up with a couple finishing up their Halloween festivities, without giving too much away it tells us the basic premise of how it's against tradition to un-decorate before midnight. This segment sets the tone for the rest of the film, comedic yet dark and gory. I won't ruin the rest of the film for you because with "Trick 'R Treat" it's a case of the less you know the better, I would even recommend you don't watch the trailer posted further down the page. Just put the film on and enjoy the surprises that await you. This film was surprisingly a straight to DVD release and it's hard to figure out why. When the cast is full of stars such as Dylan Baker, Anna Paquin & Brian Cox who all put in fantastic performances. I have to point out that it truly en-captures the Halloween spirit and that seems to be quite rare to pull off in film these days. "Trick 'R Treat" is a great film that I love to watch any time of the year but it's so much better to watch on this very special day. If you haven't already seen it then make sure you make it a priority, you won't regret it. Plus it's the film that gave us the new Halloween mascot "Sam" so if you don't know who he is yet then get watching. 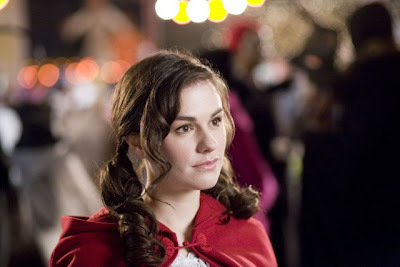 The film is based on Michael Dougherty's animated short film , "Season's Greetings", which debuted the character of Sam. The film was originally slated to be released in October 2007 for a Halloween release. Warner Bros., without explanation or reason, pulled the film from the schedule and no reschedule date was announced. One reason might have been that Saw IV was slated for release around the same time and Warner Bros. did not want to compete against it in fears of a big opening against them. Another possible reason the film was buried by the studio was that it was possible fallout from the box office disappointment of "Superman Returns", which was co-written by Trick 'r Treat writer/director Michael Dougherty and both produced and directed by Bryan Singer, whose production company produced this film. There was brief talk that the film would finally be released around Halloween 2008 and possibly early 2009 but neither release ever materialized. The film was finally released straight to DVD in October 2009. C. Ernst Harth has a cameo as Laurie's blind date, the 'Giant Baby'. In Thir13en Ghosts, he played the ghost called 'The Great Child', also a giant baby. Dwarfs were used to fill in for kids trick or treating, since this film was shot mainly at night and real kids could not work these hours. Characters from each story are frequently seen in the background of stories they are not involved with. This is to help piece together the chronology of the movie. The film had many title changes before filming began. Originally titled Season's Greetings (also the name of the short film), it was changed because it sounded too much like a Christmas film. Then it was called Halloween Terrors, Jack O' Lantern Tales, October the 31st, and Trick or Treat. 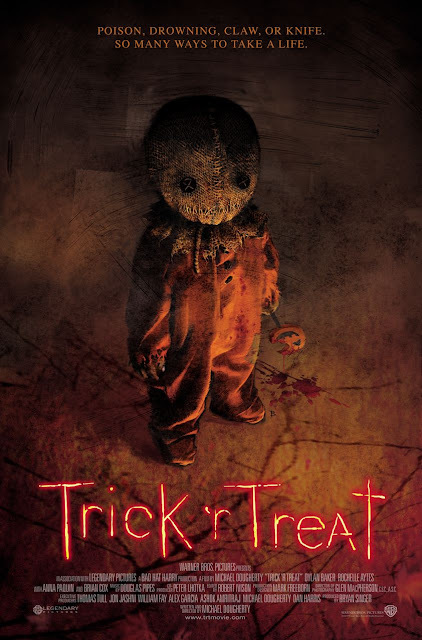 The final title was kept but since there was already a movie of the same name out, they changed the spelling to Trick 'r Treat. Most of the Jack O' Lanterns were made out of either foam or ceramic. An on-set joke was that no pumpkins were harmed during the making of this movie. The name of the character Sam is derived from Samhain, the ancient Celtic festival of the dead from which modern-day Halloween is derived. Despite having been portrayed as such in this film and several other works, Samhain is not a deity or other personage of ancient Celtic polytheism; it is only the name of the celebration. However, the idea of being either a deity or other personage dates back to at least the late first century, largely thanks to an Irish bishop named Cormac mac Cuilennàin and his book "Sanas Cormaic" (Irish Gaelic for "Cormac's Narrative"), which had identified Samhain as such. All the werewolves in this film were created by Tatopoulos Studios, the same studio that brought you the Lycans in the "Underworld" trilogy. The bottle of booze in the old man's house which ends up being smashed and wielded as a weapon is labeled Glen MacPherson a.k.a. The director of photography. The look of Brian Cox's character is based on Halloween and The Thing director John Carpenter. When the girls are buying their costumes, Danielle tells her date to meet them at "Sheep's Meadow." This foreshadows their later reveal as it plays off the idiom, "A wolf in sheep's clothing."